Exciting news! Former Sandbartender Erick is a published author! Erick's novel, "A Green Flash" is now available for download on amazon.com. And, he's set up a promotion making the novel available for FREE through March 4. If you're looking for something new to read, check it out. In a nutshell, the novel is about a man who leaves everything behind to open a bar on a tiny Caribbean island. If you love beach bars- and we think you do!- you should read this book. Click here to view the purchase page on amazon.com. "I just decided to start writing it one night when I was bored studying. I read all the time and always thought that it would be fun to try and see what I could do with a story. I didn't realize how big of a task it would be when I started, and it took a long time to write, especially while in school, but I learned a ton about myself during the process. It's one of the more mentally tough things I've done in my life." Erick hopes to have copies of the novel available in paperback format in a few weeks. On March 1, the book was #24 in literary fiction for Kindle and #99 for contemporary fiction. And, did you know that you don't have to have a Kindle in order to download this? There are Kindle apps for iPhone, iPad, Android and others (see a list here) and you can also use Kindle Cloud Reader to read books in your web browser. If you miss out on the free promotion, the book is still available for purchase after March 4 for just $2.99. Last Saturday, downtown Lawrence was inadvertently the host of yet another crazy event: the Running of the Bullsh*tters. This themed pub crawl required costumes (of course!) 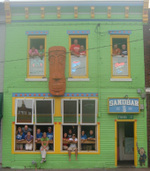 and was the brainchild of former Sandbar staffer Erick. He traveled to Spain last year and saw the famous Running of the Bulls, and decided that if we can't have exactly that in Lawrence, this was the next best thing. Participants were asked to wear white pants, white shirts and red sashes. A lucky few were selected to be the bulls. A cardboard cut-out of Michael Jordan that was inexplicably in the Sandbar's upstairs office made the trek, too. Someone apparently found humor in having a member of the Chicago Bulls along for the ride and his likeness was taped to a wooden oar. Stops included the newly-reopened Jefferson's, the downtown Lawrence sign at the corner of 6th and Massachusetts and then a trip across the river to Johnny's. Erick did a great job organizing this fun adventure. The weather was great and everyone enjoyed running (or walking) along Massachusetts, enjoying food and drink at some of our favorite places. Maybe we'll do it again next year! Our final stop at Power & Light during our Jimmy Buffett pre-party extravaganza was Pizza Bar. We were hungry and pizza sounded good. We walked in, took one look at the line and thought "we'll never get any food." But fate intervened- we spotted former bartender Erick, his sister Shelly and their parents across the bar, and as we headed their direction, we saw another familiar face. Remember the downtown Lawrence restaurant JoShmo's? The proprietor, Josh, is now working at Pizza Bar. After a round of enthusiastic greetings, Josh quickly hooked us up with a pizza. And then he also introduced Dave, Peach and the world-famous Sandbar, Home of the Indoor Hurricane to the entire crowd at Pizza Bar. The man with the microphone has all the power. And then, after all our fun at Pizza Bar, it was time to go see the man, the legend, Jimmy Buffett. If you love Jimmy Buffett or the Sandbar, you'll love this. We celebrated former staff member Erick's birthday last weekend at a party at his parent's house. (His parents are very cool Sandbar friends, too.) The family members are huge Buffett fans and have traveled to many concerts over the years and collected lots of memorabilia. Where do they display it? Why, the bathroom of course. A friend of theirs who owned a display company (I think) gave them a lighted palm tree. There's grass skirts and coconut bras on the walls. Flamingos and margarita and parrot images are everywhere. A huge frame above the counter has pictures from every Buffett concert they've been to (with Erick in the same Hawaiian shirt every time!) and sharks on top of it. We even gave them a Sandbar tabletop frame advertising Landshark. And there's a fish tank. With real fish.